We’ve had some serious rain events since the first of the year. Trying to find a river with fishable flows has been a challenge most weekends. The result has been heavy pressure on our smaller streams and rivers because they drop and clear quicker than the larger rivers. The latest storm devastated the only road between Nelson and Golden Bay over the Takaka hill and blew out the western waters. I haunted the local council’s website so I would know when I could finally get on the water somewhere. Finally, over a week later a flow gauge showed one of the major rivers had dropped to a level where I knew one of the smaller tributaries would be fishable. 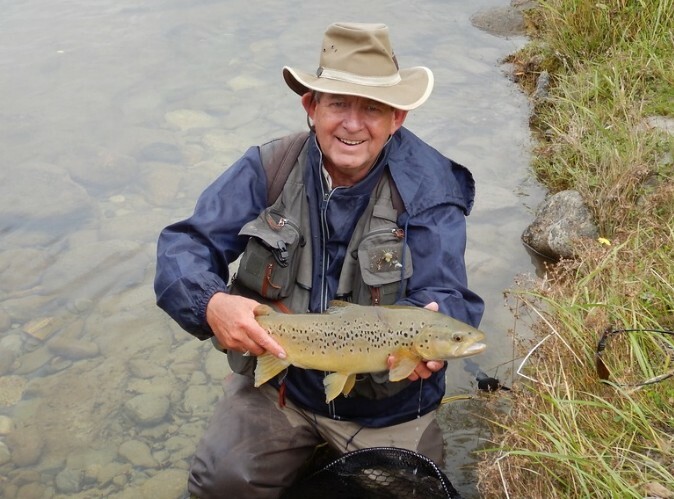 As is typical of fisherman’s luck, I couldn’t get there for four days by which time it would have been covered by who knew how many other desperate anglers. Mary was also keen to get out so I picked her up early on a Sunday morning and we headed to the river of choice. We finally got on the water about 9:30 but didn’t see anything for some time. The repeated high flows had altered most of the holes and previously good areas were no longer fish holding sites. We finally spotted a good fish while sitting on a bank eating lunch. We never saw it arrive, it was suddenly just there in front of us (how do they do that?). After lunch we crept away and I snuck to the edge of a willow and made several drifts to no avail. I had started with copper bead a #16 pheasant tail with a #18 plain PT trailer. I wasn’t sure what to change to but happened to select a #14 black beadhead caddis. On the first drift, I saw the fish turn and take the fly. I started to lift but the fish spit out the fly before the line came tight. That was the last interest the fish showed and then it swam off. I eased upstream about 10 feet and saw another big fish on our side of the river. I got in one drift when a much smaller fish moved in behind the one I had seen. I didn’t want to spook the small fish by lying it when casting to the larger one, so I tried a drift to the new fish. It shifted to its right and my indicator dipped. This time the lift struck home and I was into a feisty brown. The struggle took a while because I had opted for my 8’6” 4wt Killwell Presentation. 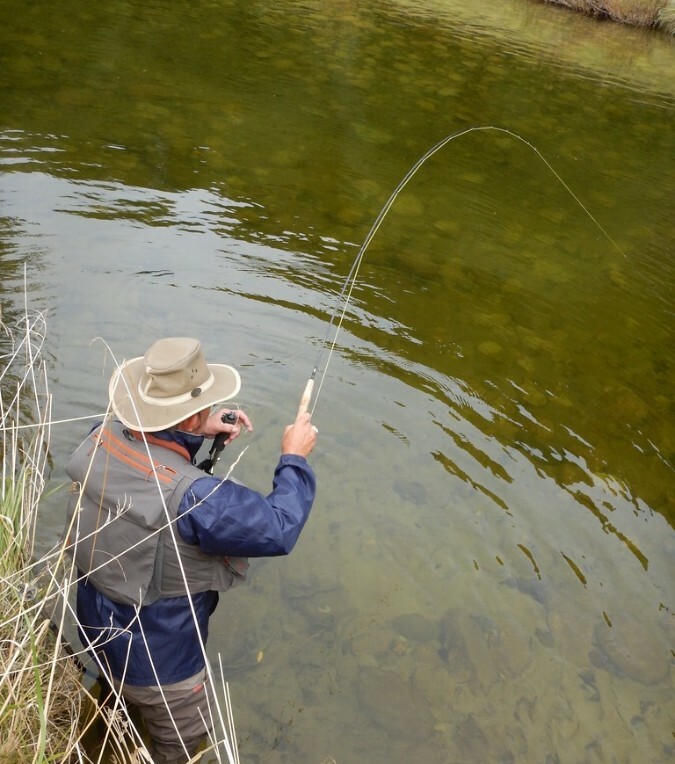 While a good rod for small streams there is no hauling in a fish once it is hooked. I got the job done in the end and a quick lift Mary got the Fin % Grin photo. Unfortunately, the big one wasn’t as cooperative and we trudged on upstream. The banks have been fenced off for some time and the blackberries have gone rampant making access impossible to more sections every year. Even the path along the fence line is all but gone and by next year could be impassable. When we finally made it back to the river, we hiked a ways before seeing another fish. 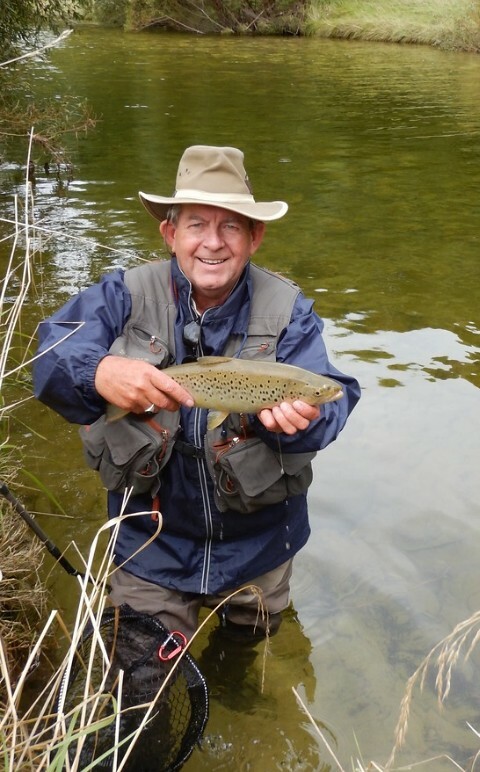 This one was a nice brown at the back of a long hole. Mary got set up with her 5wt and made a couple of good drifts but the fish moved across and disappeared. I saw another even bigger fish just ahead but it drifted into a tree’s shadow. Mary went up the bank to try to spot it but went further upstream than I anticipated. I thought she would have spooked the fish but as I stepped up I saw a good fish headed back downstream. I ducked back behind a small willow and dropped a twin nymph rig into the fish’s path. As it approached, I gave things a gentle lift and WHUMP! the fish hammered the bottom nymph. It rushed out to the middle and thrashed on top for a couple of seconds before the bigger fish I had seen started chasing it all over the place. My fish finally took off upstream but I couldn’t follow far because of a big willow tree. The fish swung back under the tree and I had to hold the rod tip under the water to keep the line clear. The fish came back a little and moved out toward the middle. It then shot back upstream and we went through the whole scenario again. 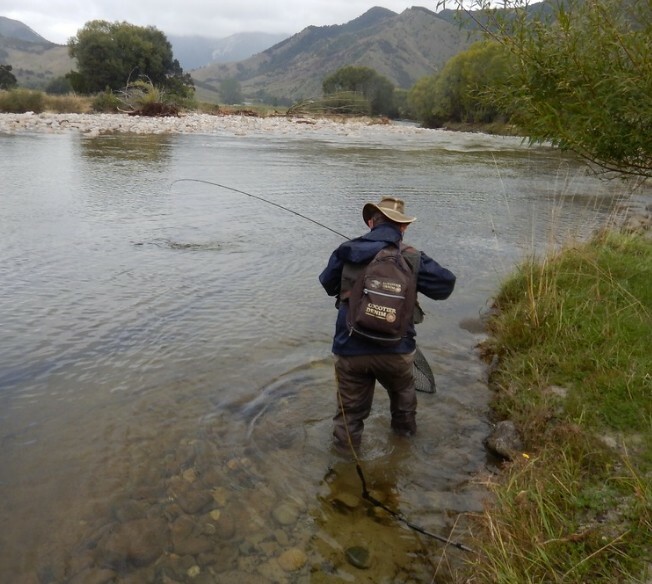 It finally came down to in front to me only to get below me and just above the out flow riffle. I managed to manoeuvre the fish next to me and get my net around its nose. A lovely 4.5 pound hen. We headed to the upper part of the hole and spotted three or four more fish and cast to most of them but other than a couple of heart-stopping inspections, we didn’t have any more luck. 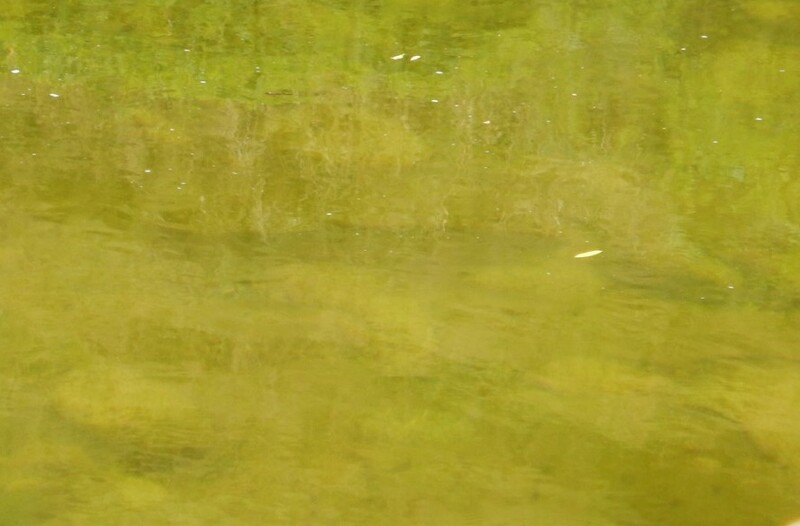 To make matters worse, the two big fish we saw at lunchtime were back in their feeding positions on the hike out. Distain is a cruel thing.